These Crock Pot Mexican Stuffed Bell Peppers are easy and delicious, and you don’t need to turn on the stove or the oven to prepare them. Just chop and mix and they are ready to go.One of my absolute favorite cookbooks is Slow Cooker Revolution from America’s Test Kitchen. So when I wanted to develop a recipe for stuffed bell peppers in the crock pot, I used their technique for Tex-Mex Stuffed Bell Peppers as a guide. It’s perfect because, you do not need to brown the ground beef ahead of time. When I use my slow cooker, I am always looking for a way to avoid precooking. The slow cooker insert takes up enough room in the dishwasher, I don’t want another pan in there too!Ok, let’s get started.Finely dice 1/2 of a yellow onion. Pour a cup of prepared enchilada sauce into a heat proof measuring cup and add diced onion. Heat the onion/enchilada sauce mixture in the microwave for about 5 minutes to soften onions. I usually cover mine with a paper towel to avoid splatters.Cut the tops off of four bell peppers, I use yellow, red or orange as the green bell peppers are not as sweet. Remove stems and seeds and dice the tops of the bell peppers.Pour 1/3 of a cup of water into the bottom of the crock pot and nestle bell peppers in. In a large mixing bowl, combine one pound of uncooked ground beef, onion/enchilada sauce mixture, diced bell peppers, 1 cup of shredded jack cheese, 3/4 cup of cooked mexican style rice, 1 1/2 teaspoons of salt and 1/2 teaspoon of pepper. 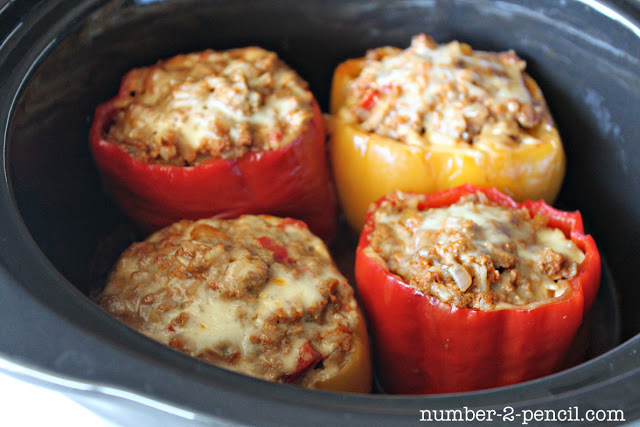 Fill bell peppers with ground beef mixture and top with more cheese. Don’t forget that you need to have the water at the bottom of the crock pot. 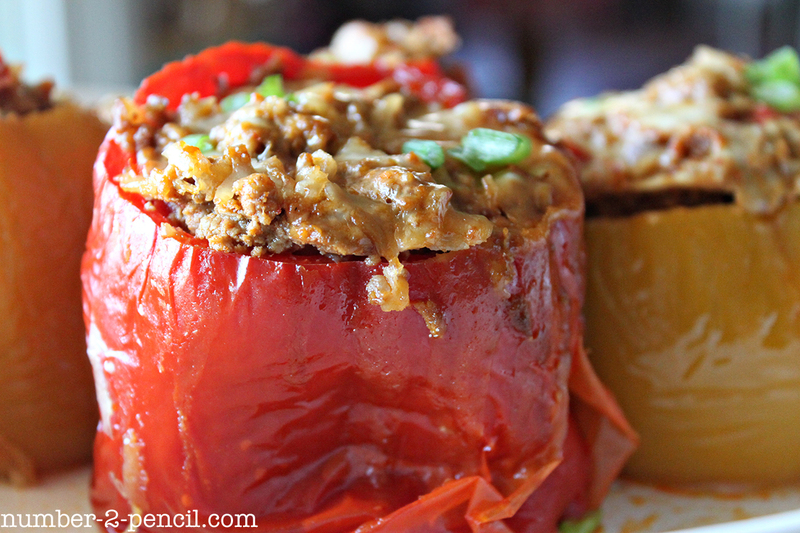 The bell peppers are soft, but not too soft, and the filling is so flavorful. I kept my bell peppers kid friendly, but you can bump up the flavor by adding a little canned chipotle chile in adobo if you want more spice! We topped ours with a little bit of sour cream and green onion, and had a simple salad on the side. 1. Finely dice a 1/2 of a yellow onion. Pour a cup of prepared enchilada sauce into a heat proof measuring cup and add diced onion. Heat the onion/enchilada sauce mixture in the microwave for about 5 minutes to soften onions. 2. Cut the tops off of four bell peppers. Remove stems and seeds and dice the tops of the bell peppers. 3. Pour 1/3 of a cup of water into the bottom of the crock pot and nestle bell peppers in. 4. In a large mixing bowl, combine one pound of uncooked ground beef, onion/enchilada sauce mixture, diced bell peppers, 1 cup of shredded jack cheese, 3/4 cup of cooked rice, 1 1/2 teaspoons of salt and 1/2 teaspoon of pepper. 5. 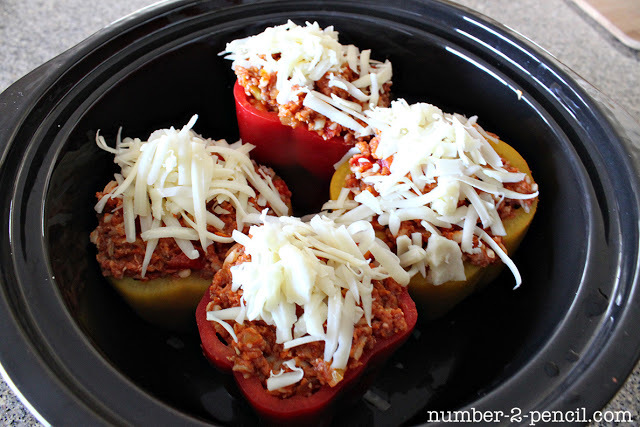 Fill bell peppers with ground beef mixture and top with more cheese. 6. Cook on low for about 6 hours. You can test mixture with meat thermometer for doneness. It should be cooked to 160 degrees. Note: You must used pre-cooked rice. I used leftover mexican rice, but you can also use cooked white rice. Just bump up your seasoning so that the mixture is not too bland. You can add chili powder, garlic powder, cumin, chipotle in adobo. Whatever sounds good to you! 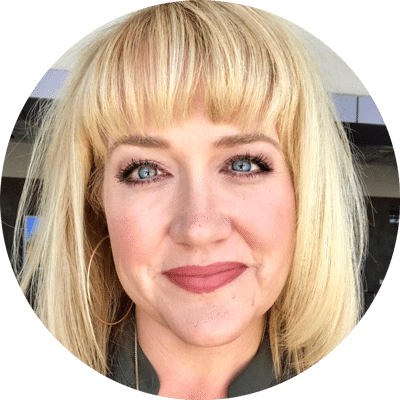 You can keep up on new posts and recipes by clicking on these cute buttons below or follow me on Facebook or Twitter. You can also find me on Pinterest, that’s my favorite place to hang out! I’d love to see you there! Great recipe! My husband just bought a bunch of green peppers, now I know what to do with them. Thank-you and have a great weekend! Wow! These look fantastic! What a great idea, using the a slow cooker during this heat wave! These sound so tasty. I want to make them for my boyfriend and I! I am making these today! they looks so pretty! These look delicious and I’m definitely going to try them but hubby doesn’t like bell peppers…any tips on something else i could bake them in??? Trying to think of something that would not go soggy in the water…. I really like this idea and the recipes that popped up related it it. I also appreciate the suggestion about the crock pot cookbook. Thank you! Could someone post a recipe for Mexican rice pls? There are hundreds of ways to make Mexican rice. My version (depeding on what I’ve got in the fridge) is to soak and then dry the rice (I use basmati), heat a bit of oil in the pot, add whole cumin seeds and let them pop. Then add smoked paprika, cumin powder, corriander powder, garlic powder and chili powder if you like it hot. 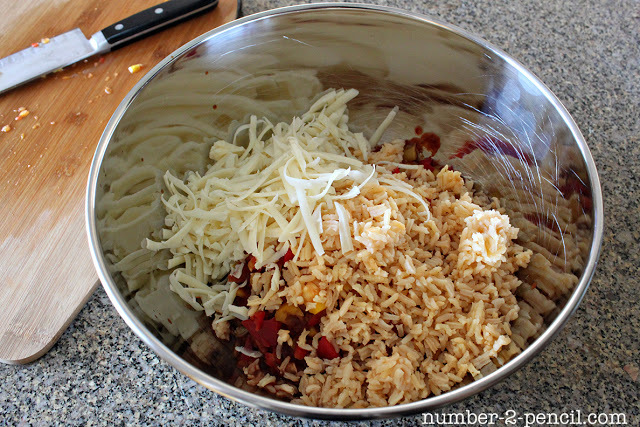 Give it a quick mix, add the rice, mix it up and then add the water (1 3/4 cup water for 1 cup rice). Bring to a boil and turn down as low as possible so that it’s almost just steaming. When you think it’s done remove from the stove, cover with a tea towel and put hte lid back on so that the steam gets trapped in the tea towel. This helps to finish the cooking perfectly. Thanks for sharing this recipe! Sounds wonderful! It’s a 5 quart Crock Pot and fits 4 peppers perfectly. i just wanted to say thank you for sharing this recipe!! it inspired me to start using my crock pot more this last week! i never knew how good stuffed bell peppers were in the crock pot 🙂 i shared, and linked back to you, your yummy meal and my tweak on it <3 thanks for sharing! These are sooooo good! Even my picky 10 year old loved them! Thank you! Yes! This is dinner tonight, thank you so much for what looks and sounds like a great recipe. We have a garden and just picked fresh bell peppers. I didnt plan too good and I am just now putting this in the crock pot! Is there any way I can cook this on high and it still come out the same??? I think you will be good if you do 4 hours on high! I am going to make this tonight. Might get some Smart Ground to make mine vegetarian, and will also look for organic ground beef to use in my kids’ peppers. If I wanted to use this recipe in the oven would I just cook the meat before I put it in and then combine everything in the skillet? How long would you think it would need to cook in the oven? Hmm, I think you could just adapt it the way it is and cook tightly covered in the oven. Make sure to include the water! You’ll have to experiment with time and temp, and I would use a meat thermometer to make sure the meat is cooked through. I just made this today and it was to-die for; the meat was so tender and the flavors were amazing. I too hate having to “prepare” meat for the Crock Pot – what the heck am I using it for if everything is already cooked before it goes in the Pot?! Anyways…I added a jalapeno (seeded) to half of the recipe for some spicy, some not. However – this made WAY more than four servings. I had big peppers, too! Thankfully I had two additional on hand and they all fit in the Crock Pot. I don’t think I’ll ever try another stuffed pepper recipe – thank you!! These are in the crock pot right now! I can’t wait to try them tonight! thank you for sharing!! Just found this on pinterest, and I can’t wait to make it for dinner! (I think I’m heading to the store so I can make it tonight!) New follower now, and I can’t wait to see what other recipes I can borrow from you! 😉 LOVE IT! Found this on Pinterest as well and have just put them in the slow cooker. I normally follow recipes to a T the first time I make them, but I’m trying to incorporate more veggies into meals. Instead of the rice I put grated zucchini, cabbage and carrot so I hope it tastes good! Thanks for the awesome recipe! My husband was just asking for stuffed peppers for dinner. I’m going to try these for him! Thanks for posting. Stuffed peppers are one of my favorite dinners! LOVE this recipe! 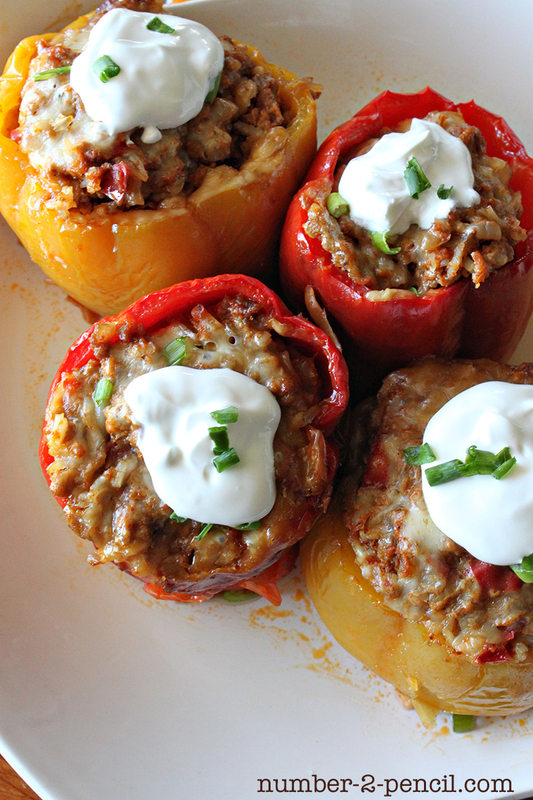 Love stuffed peppers and these look delicious! 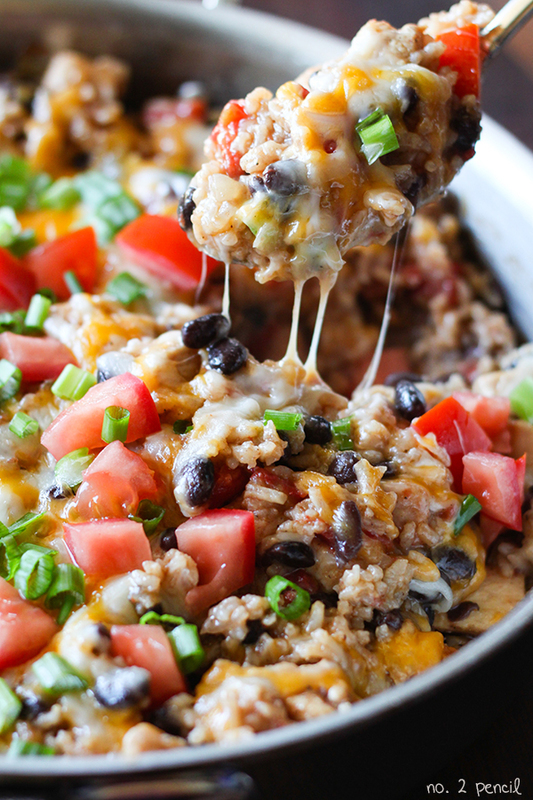 I love that you made them Mexican flavored… need to try this! Oh my goodness, I’m totally making these! I love Mexican food and these look so fun and easy! Karly recently posted…Neato Robotics Review & Giveaway! I love that this is a crockpot recipe! I can’t want to try it! 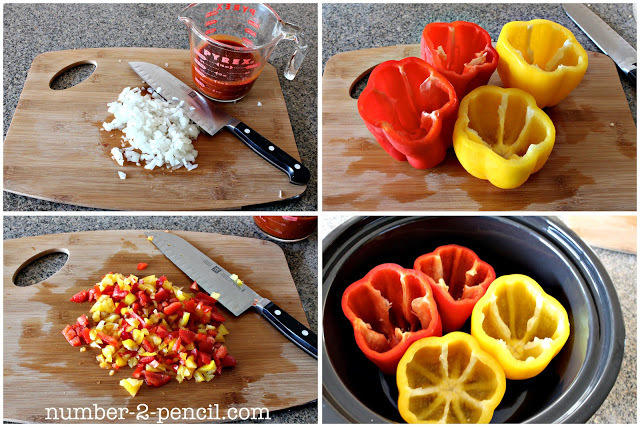 We loved stuffed peppers…I really need to try them with the red and yellow peppers though! I heart all things Mexican flavored!!! I love that you made them in the crockpot; I’ve never tried that! Thanks Melissa for the great idea! is there a way to replace the ground beef with Morning Star’s meal starters frozen grillers crumbles? I haven’t tried it myself, but it sounds like it would work great! Please let me know how it works out for you! 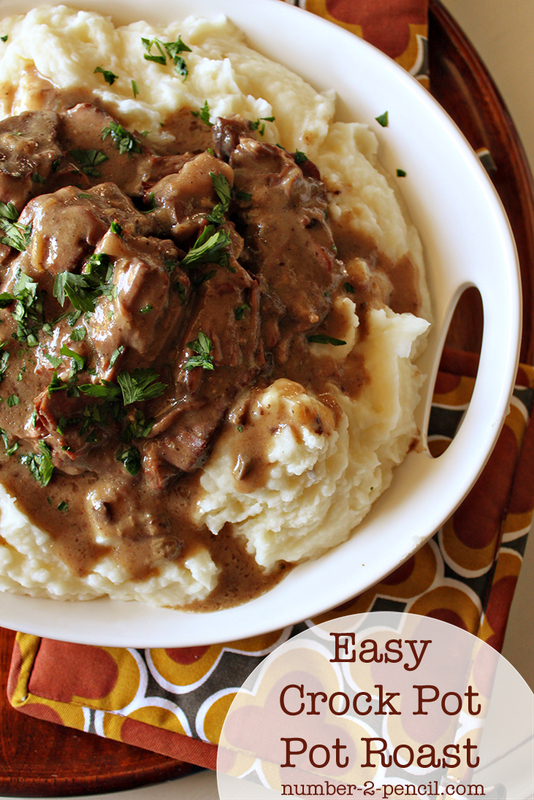 I have now made these twice – in the slow cooker and the oven! If I had left them in the pot for 6 hours they would have been sitting for four hours by the time I got home from work so I tried the oven and they were just as delicious as the first time! I used a glass casserole dish, 1.5 cups of water, and baked for 1.25 hours at 350, then let them sit for another half hour at 170 (mostly because we weren’t ready to eat yet). Love this dish! Did you cover the dish or no? I didn’t the first time I tried them in the oven. I’m short on time (again, such is my life) so I’m making this for the third time – second in the oven. I have them semi-loosely covered with foil at 300 degrees and will check after one hour. Figuring the foil will help speed it up! I usually use rotel or diced, fire roasted tomatoes and sliced onions in the bottom of cooker. After peppers are done I remove them and blenderize the leftovers and make a tomato sauce. I will try the recipe for Mexican Peppers today. Sounds really good. Thank you for sharing. I’m so excited to try this recipe! We have a very hectic schedule with only one car in a 7 member family household. I’m constantly running. 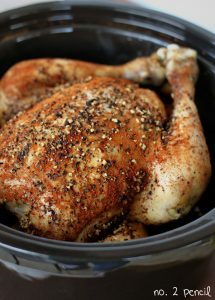 I’m always looking for crockpot recipes that are like ‘regular” home cooked meals. I’ll be cooking this tonight. Thanks! i just found this recipe on Pinterest and it’s perfect for a snow day! I have a large, oval crockpot and had enough filling to stuff 7 peppers. Can’t wait to try them later tonight! Just made these and they were awesome! My bf said he could eat this every week. Thankyou for sharing! I have mad this recipe 3 times in about two months!! It is all i want to eat!!! I use cooked quinoa instead of rice. delicious 🙂 Thank you for sharing this you are a genius. Have you ever freezed this? I haven’t but I think it would do well. Let us know if you do! My girlfriend has been begging me to make this so we’re having it again tonight. I love this recipe. These are the best stuffed peppers I’ve ever had. Dang! 2x in one week, per request! Thanks for a great recipe.